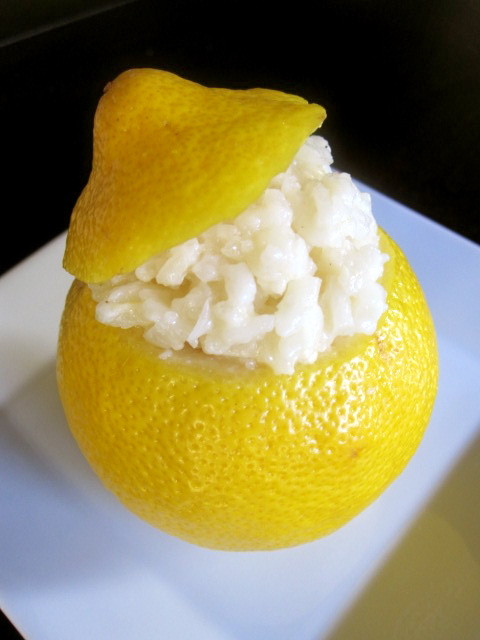 The Cultural Dish: Spring is here with Lemon Risotto! Spring is here with Lemon Risotto! In my last post I mentioned that I had not been online as much due to my sudden absorption in the book Water for Elephants. It was a great book and I definitely recommend reading it before the movie comes out in two weeks! Aside from reading, I have been praying for spring weather to arrive. After a freak snow storm on April 1st and a handful of rainy days, it is finally beginning to feel like spring here in New England! Finally! I am so excited that the weather has been improving because I love to cook with various spring and summer fruits and vegetables. In order to celebrate the changing of weather, I am kicking off my first official "Spring Post" with a Lemon Risotto. Risotto is an Italian dish that consists of rice cooked in a broth that makes it very creamy and delicious! The addition of the lemon flavors makes this risotto so light and flavorful that it is sure to drag anyone out from the winter blues! In a medium saucepan, bring the chicken broth and water to a simmer and leave on low heat. In another medium saucepan, melt 2 tablespoons of the butter. Add the shallot and sauté for about 3 minutes. Pour the rice into the pan and mix in with the shallot. Then, add the wine and simmer until the wine is reduced. Once the wine has reduced, add about a 1/2 cup of the broth. Simmer and stir until almost reduced (a few minutes). Continue adding about a 1/2 cup of the broth at a time, allowing to reduce before adding more. Once all of the broth has been used, remove from heat and mix in the last tablespoon of butter, Parmesan cheese, mascarpone cheese, lemon zest and juice, and salt and pepper to taste. The rice mixture should be creamy but still somewhat firm to the bite. Serve warm as a side dish to accompany dinner or during brunch - Enjoy! And before I forget, I want to thank Manus Menu for bestowing upon me several awards! You can view her wonderful blog and awards here. Be sure to check out her awesome Italian dishes and the recent bake sale that she participated in for Japan! It was a great book and this is a great risotto. I love your presentation in the lemon. Thanks for sharing the recipe. Hi Elyse! I have so many lemons from Costco and this recipe looks perfect dish to make! Hmm I can taste it already. Thanks for yummy recipe! Lovely! Lemons are my ultimate kitchen staple-especially this time of year-although its still feeling pretty wintery here in Seattle. I am so looking forward to trying this! So lovely in the lemon cup!!! Love this risotto and your presentation is so cute! Perfect for Spring! Your presentation of the risotto in that sunshine yellow lemon is enough to chase away the winter blues. What a simply gorgeous dish! Lovely presentation, Elyse...it looks amazing!! Gorgeous risotto! I love how you served it in the lemons! Brilliant presentation. It looks very 'springy' and yummy! I love lemon in risotto and I loved Water For Elephants too! I didn't know about the film, who's in it? Reese Witherspoon and Robert Pattinson... kind of an odd couple but the previews look great! By the way, I've given you an award today! I love the presentation! It looks great! So happy we finally got nice weather this weekend! I've been meaning to read that book. Thanks for the recommendation. The risotto sounds delish. Love the way you presented it. Yum! So creative in your presentation as well as a fabulous looking tangy recipe. Brilliant. Great presentation! Lemon is one of my favorite flavors and this sounds like a great recipe to serve with fish. Thanks on the book recommendation as well, I've been seeing movie trailers and it looks good. I haven't made risotto for a such a long time. Thanks for providing such a great recipe. I am looking forward to trying it soon. I'm always looking for great risotto recipes and this sound one sounds wonderful! I bet the lemon makes it tangy and yummy. Will definitely try this! I've done mascarpone in risotto once before and it's a wonderful addition! I love lemon anything, and I really love your presentation. I saw your recipe on YBR roundup and it looks amazing! Yes, I came from YBR straight here to check this out too. Your lemon risotto looks so colorful and tempting in its lemon shell, I'm sure after this spring will come to where you are soon! Thanks for participating in April's YBR :) I love how creative you were with the presentation, gorgeous! I can't wait to try this very unique recipe. Lemon risotto is my favorite, especially when served with seafood! Your plating is so, so adorable!! OMG i have been looking all over for a simple, delicious risotto recipe to practice with (i've never made it before) and this looks perfect! That looks amazing! I love lemon anything and who doesn't like risotto?! Fabulous! I agree with OnSugarMountain (post above me) - LOVE the lemon cup and the photos ARE amazing!